Families strolling with their dogs and playing fetch is an everyday sight in Yoyogi Park. Once a year, the park is instead filled with wagging tails belonging to dogs from shelters around Japan, all eager to take walks with people and potential companions at the annual Sanpo in the Park adoption event. 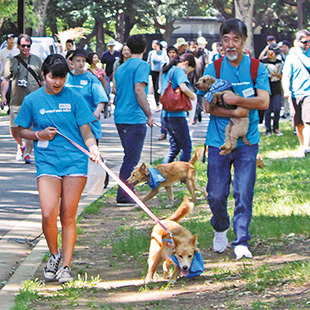 Organized by animal fundraising organization Animal Walk Tokyo, Sanpo in the Park gives people and shelter animals a chance to interact with one another, and lets guests learn about adoption choices available in Japan. 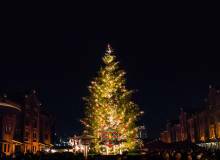 The event, typically held on a Sunday, includes a relaxing walk around the park, along with live entertainment, snacks, and a chance to mingle. Meanwhile, the money raised goes toward supporting the efforts of local shelters to house and care for their animals. 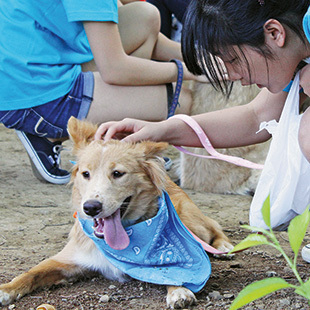 2014’s Sanpo in the Park raised ¥230,000 in benefit of two local shelters. 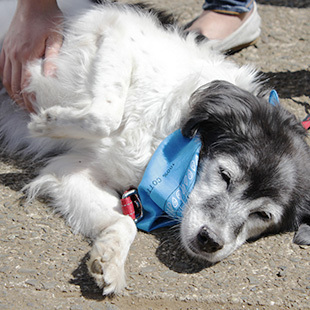 The event also raises awareness of animal welfare-related issues in Japan. The volunteers involved then decided they could help animals by helping to close the gap between Japanese-run shelters and Tokyo’s English-speaking community, and came up with the idea of fundraising walks with shelter dogs. The first Sanpo in the Park event took place following the 2011 earthquake, in support of rescue efforts for animal victims in Tohoku. 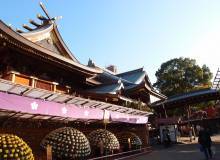 This year’s Sanpo event, held on June 7, promises plenty of animal interaction and entertainment. 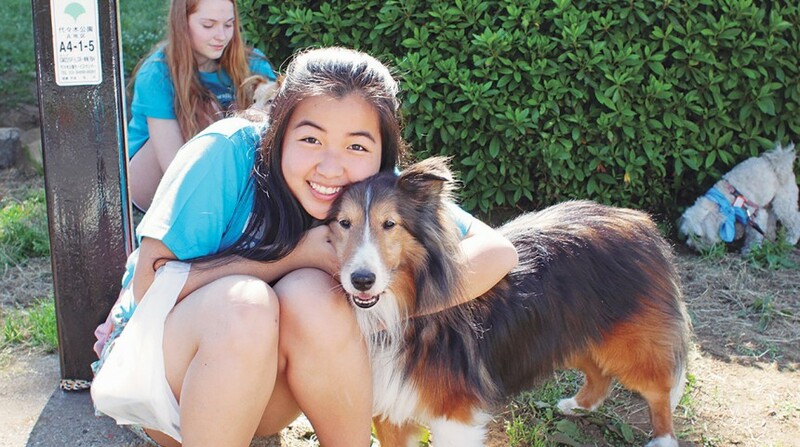 Following three walks among cuddly, rescued dogs, attendees will be treated to some hula dancing and live musical performances, as well as workshops on training dogs and a chance to make toys for donation to shelters. The beneficiaries this year are ALMA (Animal Life Matters Association) and Dog Shelter. ALMA is an organization that operates the ALMA Tokyo Tierheim shelter in Katsushika-ku, and adopt-out over 15 animals monthly, on average. Dog Shelter rescues soon-to-be-euthanized dogs from government-run pounds, provides dogs with check-ups and vaccinations where necessary, and assesses families to see if they match well with their pup of choice. Funds are split between ALMA, who will use the donations raised for general operations of their shelter, such as food and medical costs, and Dog Shelter, who will use proceeds to care for their senior dogs, which especially have difficulty finding adoptive families. She adds that many of the animals in the pounds are brought in by their owners, without looking at alternatives. Regarding adoption, fellow Animal Walk Tokyo member Katrina Larsen states, “By adopting from a shelter, you can save a life and will not be supporting puppy factories or unscrupulous breeders.” Larsen continues that many animals from shelters are house-trained, socialized, spayed or neutered, with all their medical records up-to-date, and are patiently waiting for forever homes. “[ALMA or Dog Shelter] staff will carefully ensure that you and your buddy are a good fit before adopting out. Sanpo in the Park. Jun 7, 9:30am. Yoyogi Park, by the water fountains toward the lake. ¥1,500. www.animalwalktokyo.org. ALMA: www.alma.or.jp. 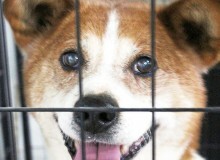 Dog Shelter: http://dogshelter.jp.